A SQL Server backup and restore strategy is an essential process to safeguard and protect critical data. The vital role of any DBA is to minimize the risk of data loss and preserve data modifications at regular intervals of time. A well-planned and well-tested backup-and-restore strategy always help to protect the organization with no data loss, or at least a minimum, from the many varieties of system and database failure. As such, it is recommended to understand the importance and implication of the backup-and-restore strategy. One should understand the basic business requirements, of an organization, and system internals so that the good backup-and-restore strategy can be defined. OLTP workloads define the state of the data. Data-manipulation and data-transformation operations define the memory and disk requirements for the operation to complete. A good knowledge about the systems and local applications is always a key factor for successful backups. Improper management of backups may lead to a greater risk to database availability. In-Memory OLTP engine and storage engines both use the same transaction log and Write-Ahead Logging (WAL) logging mechanism; however, the log record format and algorithms used for In-Memory OLTP logging mechanism is entirely different. It generates log records only at the time of a commit transaction. There is no concept of tracking uncommitted changes and there’s no need to write any undo records to the transaction log. In-Memory OLTP generates logs based on the transaction write-set. All the modifications are combined to form one or very few log records. The SQL Server engine handles the backup-and-recovery of durable memory-optimized databases in a different way than the traditional database backups. As we know, any data held in RAM is volatile and it’s lost when the server reboots or server crashes. However, the In-Memory architecture is engineered to create a backup of the data on the localized disk. As it’s a memory-centric, this adds a new step in the database recovery phase. Memory management is a very important step. If it’s not managed, we’ll end up with out-of-memory issues. When SQL Server instances restart, each database goes through different recovery stages. Redo: This is the roll-forward phase. When this phase completes, the database comes online. For disk-based tables, the database is moved to the current point-in-time and acquires locks taken by uncommitted transactions. For memory-optimized tables, data from the data and delta file pairs are loaded into the memory and then update the data with the active transaction-log based on the last durable checkpoint. During this phase, disk and memory-optimized based object recovery run concurrently. In SQL Server 2017, the redo phase of the memory-optimized tables (the associated data and delta files) is done in parallel. This results in faster times for database recovery process. When the above operations are completed for both disk-based and memory-optimized tables, the database becomes online and available for access. Undo: This is the rollback phase. It holds the list of the active transaction from the analysis phase basically undoing the transactions. This phase is not needed for memory-optimized tables since In-Memory OLTP doesn’t record any uncommitted transactions for memory-optimized tables. A checkpoint is a background process continuously scans the transaction log records and then writes the data and delta files on disk. Writing to the data and delta files is done in an append-only manner by appending newly created rows to the end of the current data file and appending the deleted rows to the corresponding delta file. For persistence, the data for memory-optimized tables are stored in one or more checkpoint file pairs (CFP). The data file(s) store inserted rows and delta file(s) stores the references of deleted rows. The update operation is an insert followed by delete rows. Over time, based on the merge policy, the background checkpoint process merges the CFP’s into a new CFP and older CFP’s go through removal process with a process of garbage collection. The full database backup size is 5.3 MB. The space consumed on the disk is 156 MB. On comparison; backup size is relatively much smaller in size. On other side, though the database is empty, still there is a lot of space consumed on the disk due to the fixed storage constraints. Now, initiate a full database backup. As we can see that the database backup command is no different from the standard backup command T-SQL. Let’s initiate differential backup. The backup size is relatively smaller than the full backup. Execute the backup log command. This proves that it’s no different from normal backup operation command. Using sys.dm_db_xtp_checkpoint_files, it’s really that easy to see the state_desc. The “WAITING FOR LOG TRUNCATION” state of the checkpoint files reminds to backup the transaction logs. Checkpoint files go through various stages before they can be deleted and removed. In this section, we will discuss the steps to restore the In-Memory optimized database. As we can see that the database restore commands for an In-Memory optimized database are no different than traditional database restore commands. But, there are few key points to consider. In this case, the size of the memory optimized objects is relatively small (~400 MB). Loading such a small chunk is relatively pretty straightforward. When dealing with larger objects, here are some of the general recommendations for how much memory is needed for the restoration activity. Note: The outcome of the database restore always depends on the available resources. A key consideration for piecemeal restore of the memory-optimized database is that the file-group must be backed up and restored together with the primary file-group. If you’re intended to back up or restore the primary file-group, it is must to specify the memory-optimized file-group. In the backup T-SQL, we can see that primary and SQLShackInMemDB_FG are added. It is must to include the primary file-group, if you intend to backup memory-optimized file-group. Now, backup the secondary filegroups. 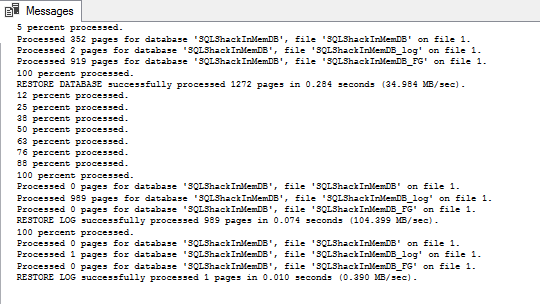 Here, SQLShack_IndexFG is the index file-group. Thus far, we have seen the database backup operation. Now, we will see how to perform the database restore. To restore the database, first restore the primary and memory-optimized file-group together and then restore the transaction log. Memory-optimized tables are backed up with regular database backup options. The CHECKSUM clause is used in addition to validate the integrity of the data and delta file pairs storage allocations. The process of transaction logging is optimized for scalability and high performance through the use of reduced logging mechanism. Some extreme cases, like where the system is running out of disk space, may lead into the delete-only-mode. Using transaction log and data and delta files, In-Memory tables are automatically rebuilt. As Data and Delta files are loaded and processed in parallel, the outage is further shortened by enforcing faster database recovery technique. Finally, transaction logs are applied to bring back the database online. We ran through the backup and restore procedures with no additional backup procedures. The SQL Server engine manages the In-Memory database recovery process and it’s relatively straightforward with some additional steps. For durable memory-optimized data, the process has to stream the data from CFP (Checkpoint-File-Pairs) back into the memory. The restore activity may fail due to out-of-memory errors. It is recommended to configure a dedicated resource pool for In-Memory optimized database. In general, there would be a need of 3 * the size of the durable memory-optimized memory for the successful database restores operation. I would recommend testing the backup and restore procedures in your environment.